Three days. How do you possibly see all that Beijing has to offer in just three days? Well, it wasn't a leisurely holiday, that's for sure, but I gave it my best shot. I had just seven days for my Easter holiday this year, and since the Chinese tourist visa is a bit pricey, I didn't want to make multiple trips there, so I had to construct a busy itinerary. I ended up getting the double entry visa, as there was no way I could do it all in a week, so I'll be back in China some point within the next few months to visit Shanghai. For this trip, I chose Beijing, Zhangjiajie, and Xi'an, to see the highlights of the country. I arrived in Beijing around midday on day one of my trip, having been unable to get a flight after work the day before. I was a bit nervous about travelling around China on my own, as I'd heard it can be very difficult if you don't know the language (which I don't) or don't have a guide (I was on a budget, so no). Beijing was a good place to start though, as cities tend to be easier to navigate than more isolated, rural areas. And it was true enough, as I was able to take the Airport Express and then another subway line to reach my hotel, since all the signs were available in English, and the hotel staff spoke enough English for my basic check-in questions. I dropped off my things and headed out again immediately to start my sightseeing - Beijing has so many historical sights, so I only selected the top few to visit. As I've mentioned in the past, I'm not a history buff by any means, so I was also skipping out on the guided tours offered at each location, and I hadn't done all that much research about the country or its history prior to the trip (I've done a bit more now!). Anyways, I began with the places within walking distance of my hotel, starting with Tiananmen Square, a huge open square in the middle of the city. You actually have to queue up and pass through a security check to enter (there's security checks everywhere in China, like to enter the subway), but fortunately you can use a tunnel to cross the road to the Forbidden City to avoid having to queue up for the check twice. 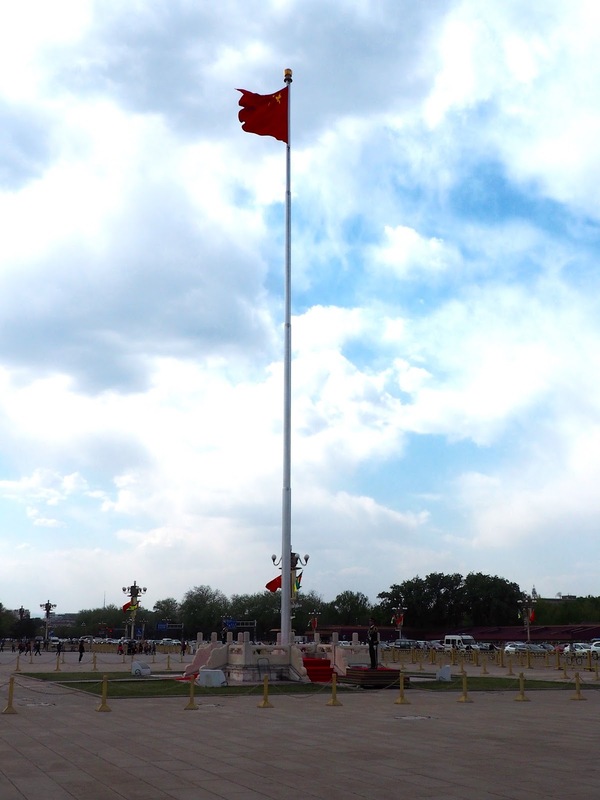 The square is a huge space, with the Chinese flag nearest the road, and the large Monument to the People's Heroes behind it. The National Museum is located here too, but I was too short of time to pay a visit. This is also the location of the Mausoleum of Mao Zedong, who also proclaimed the founding of the People's Republic of China in this same square in 1949. I hopped across the road next, to visit the Forbidden City, now the site of the Palace Museum. It was home to the emperors of the Ming and Qing dynasties for hundreds of years, from the 15th to 20th centuries, until the empire became the Republic of China. I knew it was big, but I hadn't realised just how big it really was. I opted to get an audio guide on my way in, so I learned a bit more information than I would have otherwise - there's signs in both Chinese and English, but the guide has more information. The central halls and gates, leading up the middle channel are the largest and most spectacular, with their perfect symmetry, and bright coloured, intricately designed paintwork. Each is separated from the next by large stone courtyards, often with a central pathway picked out in white only for the emperor to walk along. The guide was particularly good for telling me the functions of these buildings - which was for banquets, which was where the emperor or empress greeted guests and such. These buildings were largely for formal events and state affairs; the living quarters of the emperor and his family would have typically been in some of the Western and Eastern palaces. There are six of each, and I wandered through a few of them, but not every single one. These were smaller and I could notice a difference in their design, often featuring dark wood and less bright colours. There were some interesting stories on the audio guide, especially about some of the concubines! Beyond the Eastern palace there are even more buildings, which house some special exhibitions. You have to buy another (cheaper) ticket to enter these, and I had planned to, but the last entry to the area is about an hour before closing time (it's also the last entry time to the whole City) and I just missed it. Instead I finished up with a wander around the small Imperial Garden, just inside the north gate as you exit the palace. I knew that China was an empire for many years, and the Forbidden City was the palace, but I didn't actually realise just how recent it was (it only became a Republic about a hundred years ago), so it was very interesting to walk around the site and think about what daily life here looked like not that long ago. My visit took around an hour and a half I think, and would have run over two hours had I visited the special exhibitions - but my audio guide said to visit every building thoroughly would take around four hours! My last stop on day one was Jinshan Park, just to the north of the Forbidden City. It's a small park, which had plenty of flowers in bloom in April, and of course, there are numerous pavilions throughout it, as I've come to expect from most parks. It was an imperial park in the time of the Ming and Qing dynasties, before being opened to the public as it is now. 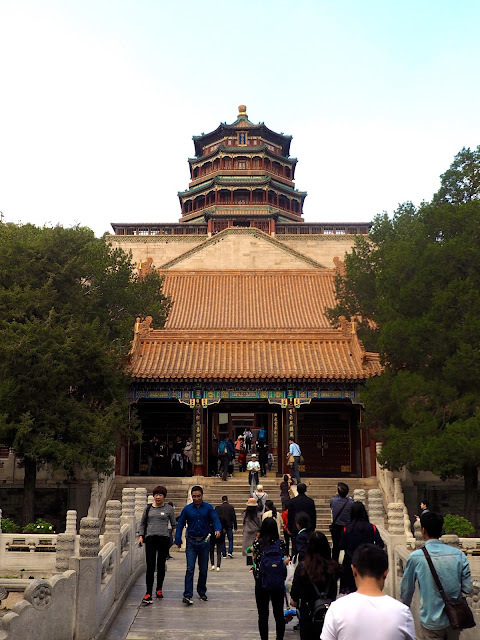 The real highlight of the park is to climb to the top of the hill, to the Wanchun Pavilion, the highest point in Beijing, from which you get an excellent view over the whole of the Forbidden City, and much of Beijing itself. 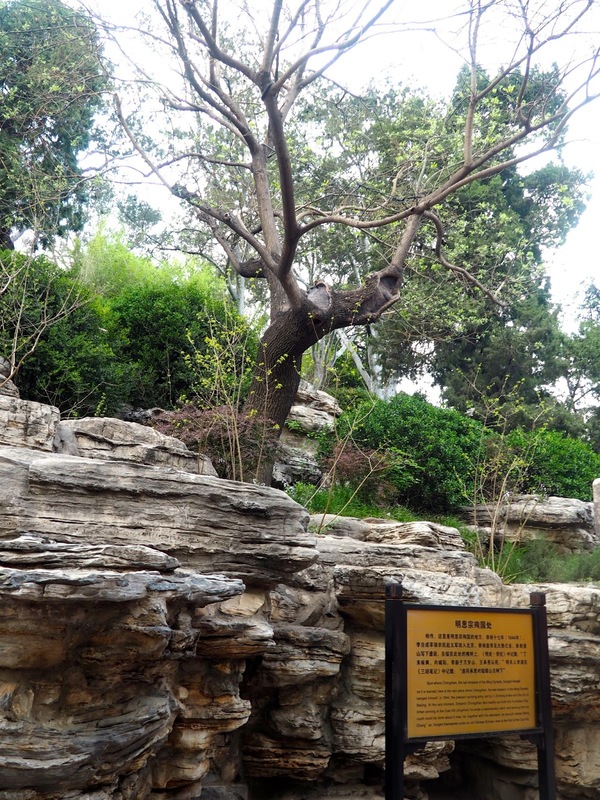 There is also a highly notable tree inside, with a plaque explaining that this is where Chongzhen, the last Ming dynasty emperor, hung himself in 1644, when rebel forces took over Beijing. My visit here was fairly brief, as I was pretty exhausted (having been up since about 3am for my flight! ), but it was definitely worth going up the hill to see that view! This was my only full day in Beijing (since I landed on day one and would leave again on the evening of day three), so it was time for me to head to China's most famous sight of them all - the Great Wall. 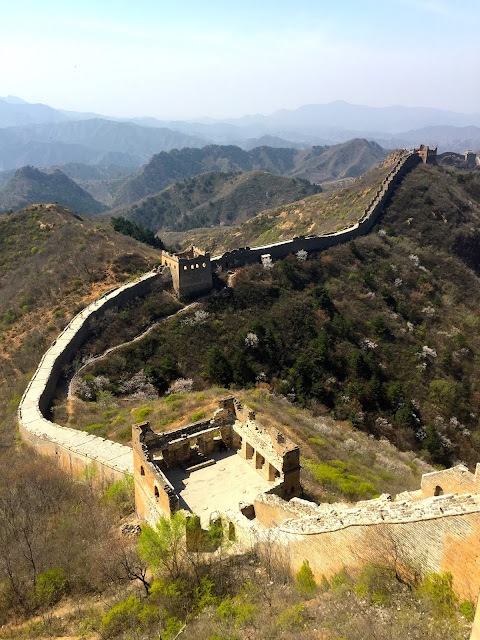 For this I had booked a tour, through a company called Tour-Beijing, as research suggested it would be pretty difficult to get to and from the Wall on your own, especially the section I wanted to see. It was a coach tour, not private, but only had around 20 people on it, and there were none of those terrible commissioned shopping stops I'd read about. I enjoyed this tour in particular, as the guide gave us information about the wall while we were on the bus, but then we were free to explore and hike along it at our own pace - none of that everyone stick together and follow the flag business. 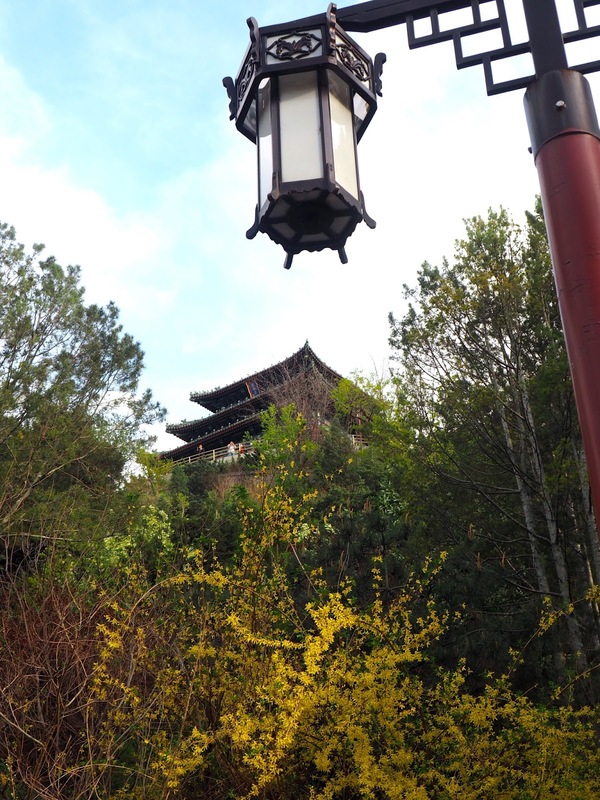 I chose to visit Jinshanling, rather than the more popular Badaling or Mutianyu sections, which are always flooded with tourists. 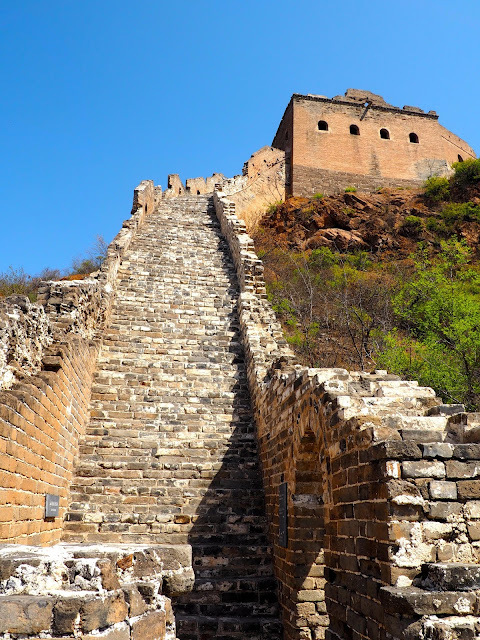 Jinshanling is about two and a half hours from Beijing, and has both restored and wild sections, allowing you to see the best of everything the wall has to offer, and there were only a couple of other groups on it besides ours. It was an early start, as I got picked up around 6.15am, and then a long drive once we'd picked up everyone in the group, so we reached the wall around 9.30am I think. We learned a bit about it's history on the way there, that it was built to defend China from Mongolian attacks from the north, and that some towers were watchtowers, where soldiers stood guard, and other were only for lighting beacons on, and that it probably took about a million people to construct it. The route we were hiking was estimated to take around 3 hours, and we were advised to allow half an hour to walk back down to Jinshanling East, our exit point. The climb on to the wall itself was actually not as bad as I'd expected, but it was a steep climb up the stairs built into the hillside, which took about 10-15 minutes. Setting foot on to the Wall itself is quite a moment, as I'm sure many other like me will have grown up being familiar with images of the Wall. I've visited many amazing sights over the years, but every time I visit one so iconic that I've known about forever (such as the Eiffel Tower or the Coliseum), I get hit with a very surreal feeling of this place is real and I'm actually here right now, and it was no different with the Wall. It's as big, if not bigger, than I'd expected, stretching faraway into the horizon in each direction. The first section of our hike was on the restored section, with all the steps and walls fully built up again. This made it easier to walk along, but there were still a few steep ascents along the way. The staircases in particular are very steep and narrow - my feet didn't completely fit on most on them! As we continued, we got to the wilder section, with loose bricks and worn steps along the way, which has been left in its natural state like this for hundreds of years. This was a little tougher, and the inclines got steeper along here - both with stairs and slopes, which I almost had to run up while bent double, as there was no grip on the stones underfoot! It was exciting though, to be explore something so ancient and wild, with very few other people around. Much to my surprise, I was at the head of the group most of the time (you tend to go faster alone I guess, but I wasn't the only solo traveller there), and the first to finish, taking only 2 hours to hike along the Wall, then the half hour down to the meeting point. I didn't feel like I'd rushed it though, as I paused plenty along the way to enjoy (and photograph) the views. It was a bit annoying to have to wait nearly an hour for everyone else to finish though. Once we were all there though, it was time for lunch at a local restaurant nearby. I chickened out of trying food a few times on this trip, as most restaurants have no English speaking staff or menus, so you just have to guess what you want, and I don't like eating out alone much either. It was nice then, to share a meal with everyone, chat to the others more (since I hadn't during the hike, wanting instead to go at my own pace and soak in where we were on my own), and try the foods on offer. The set-up was very similar to what I've had before in Hong Kong, with a revolving table and loads of different dishes to choose from - accompanied by rice of course. Some of it was familiar to me, others were less so, but it was all pretty good - except the tofu, not for me! Then we drove back to the city, so it was more than 3 hours later by the time I got back to my hotel, after dropping others off and fighting through traffic on the way, by which point I was fit to drop for the evening! I started the day by checking out of the hotel, and storing my luggage there, as my flight was that evening, but I still had a whole day left for exploring first. I hopped on the subway and headed to the Temple of Heaven first. This was built around the same time as the Forbidden City, and emperors would come to worship here. The surrounding area is now a park, so if you want to actually visit the temple complex I recommend you buy the 'through ticket' as you come in, otherwise you only have access to the park and have to pay again to get to the temple. The park itself is big and very pretty, and I spent a while wandering around it after seeing the temple complex, taking my total visit time to about an hour and a half (and I probably would have stayed a bit longer if I'd had more time). 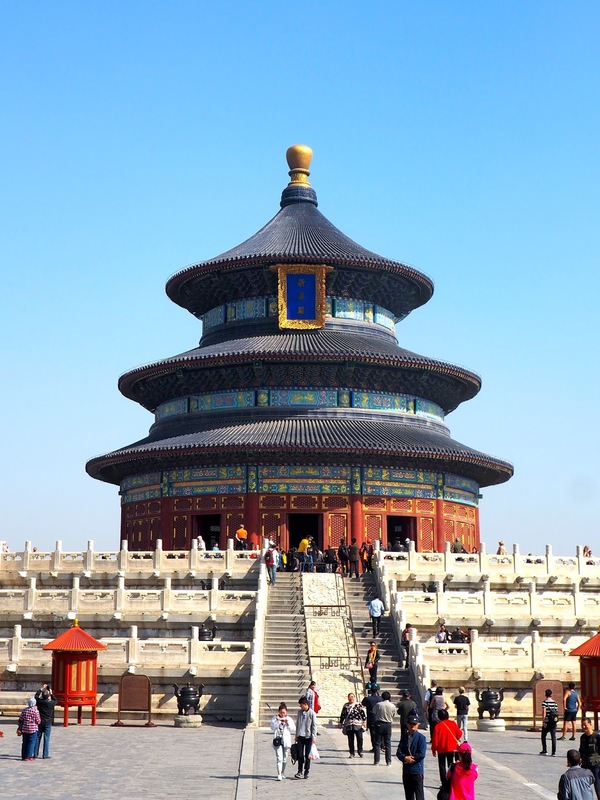 There are three main parts to the temple complex; the Hall of Prayer for Good Harvests, the Imperial Vault of Heaven and the Circular Mound Altar. The Hall is the most iconic building, and I really liked it, with the circular design and blue roof making a nice change from the typical square, red-and-yellow temples and buildings I'm used to seeing. There's a long walkway down to the other two, which are interesting themselves too, if somewhat smaller than the Hall. The Vault is surrounded by the circular Echo Wall, which allows people to communicate from opposite sides of the courtyard, a very interesting feature! And the Altar is a large, raised, flat circle, made of nine concentric circles, and the number continues to appear in many aspects of the architecture, as it's considered a heavenly number. The central circle, the 'Heaven's Heart' amplifies the voice of someone standing on it, due to the architectural design of the Altar, so the emperor's voice would reach heaven. After visiting these sights, I roamed the park for a bit longer, and I particularly liked that there were some areas that were carefully, symmetrically designed in their landscaping, and others that were left more natural, which was an interesting contrast. After a quick bite for lunch nearby, I got back on the subway and headed north for nearly an hour to visit the Summer Palace. I spent just over two hours here, but could easily have made an entire day of it, if I'd had more time and didn't have to rush back to the airport later. The Palace was far larger than I'd been expecting, because of its vast grounds and lake, which are all very beautiful - these actually made me prefer it to the Forbidden City, with all its stonework. I bought the 'through ticket' here as well, to have access to all the buildings and features inside, the first of which was Suzhou Street. I entered from the northern gate, and immediately went down to the Street on the riverbank, which is a group of little tourist-type shops and restaurants along the banks. It's a one way walk around the narrow streets, and I didn't buy anything there myself, but it was a very pretty spot, with typical classic Chinese architecture, lots of lanterns, and boats available to take you along the river if you want. From there, I headed up Longevity Hill, passing through the various Halls on the way. It was a much higher climb than I'd anticipated, as the hill wasn't really visible from where I entered. It was only when I descended the other side, to the shores of the lake, that I could really appreciate the size and beauty of the Palace grounds. I walked along the Long Corridor, next to the lake, stopping only to look in certain buildings, as I had to watch the time. I had to visit the Tower of Buddhist Incense though, which is spectacular in its size and decor. The best views of it are from further around the lake, where you can really see the whole thing, but if you go inside and climb the many, many stairs, you get stunning views of the lake and grounds as well. It's really the centrepiece of the whole Palace I'd say, and definitely the building to check out, if you do no others (though you should!). I continued to walk around the lake after that, heading towards Nanhu Island, which is connected to the shore by the long 17-Arch Bridge. I only looked around the island very briefly, which is the location of the Dragon King Temple - definitely the one with the coolest name! I could only visit most of the temples and halls in the Palace very briefly, or not at all, so a longer visit would have been nice, but I've also been in Asia long enough that I've seen plenty similar places. It was really the lake and the sprawling grounds that I liked about this place, especially on such a sunny day. I had time for one more stop on my way out, which was the Garden of Harmonious Pleasures, a quiet, serene group of pavilions situated around a small pond, with koi fish, and willow trees draping their leaves in the water, and certainly one the prettiest, most peaceful spots in the (tourist-rammed) Palace.